Your kids can also use it! Ok that was just for starters 🙂 You know there will be more after I have consumed second coffee.. The point is, that this is such a versatile piece of weaving equipment, and its so easy to use, that it’s easy to get enthusiastic about it! We recently started a new Facebook group on Circle Weaving, and one of the first things I have noticed that makes this group such a pleasure to hang out in, is the sense of cooperation and sharing among the group members. I think this is encouraged by the very nature of the loom and the kind of weaving we can do on it, because it is FUN and SIMPLE and non-threatening. Its not something high-brow or elitist or specialised, things that sometimes lead to a high level of competitiveness and individualism. Nope our little circular loom is a humble wee thing, but just look what people are doing with it! 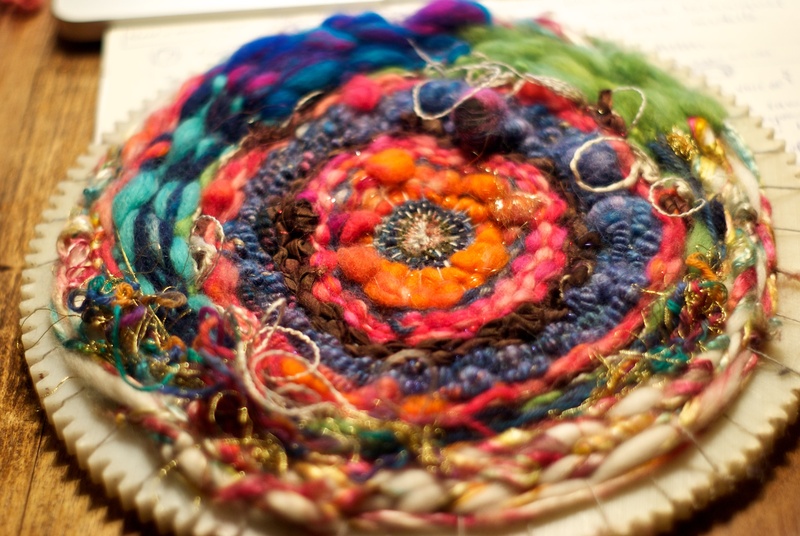 It blows me away, AND the willingness of the Circle Loom group members to share their ideas. 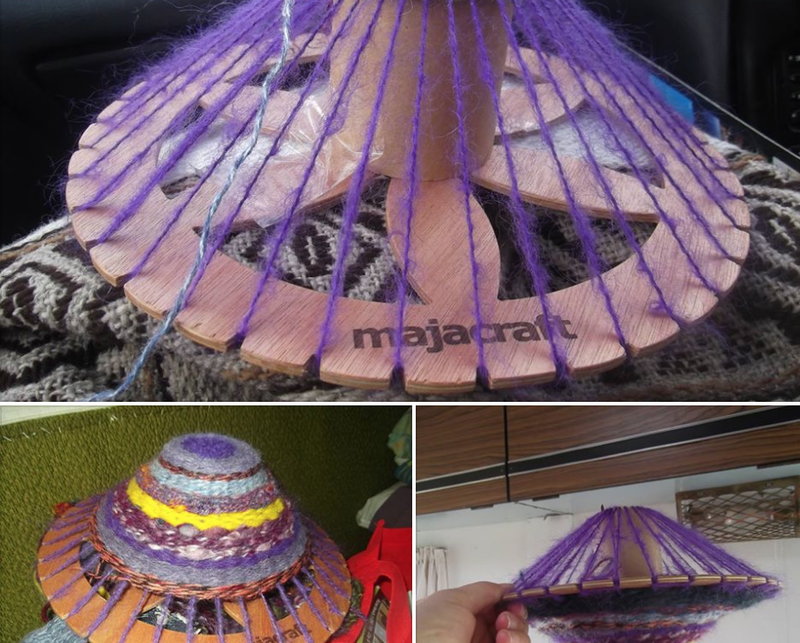 This has been the other spectacular thing I have observed (and taken part in) within the Circle Weaving group, the actual development of these ideas on the group page. This is a 3d warping idea That Nigela Jamieson had come up with and was experimenting with, a really interesting discussion ensued as it triggered even more ideas! This to me is complete awesomeness, someone posts a question or an idea they are trying out, someone else posts to add more ideas that have sprung from the original one, suggestions go back and forth, its a whole cooperative creative process that actually gives us all the ability to take part in the growth of ideas and from there, into experimentation with them and ultimately into making things that we possibly would never have thought of in isolation. I love the process of cooperative creativity, and its a wonderful thing to be a part of. In fact the creation of this group page itself is a collaborative project and my partner in crime for this is Andrew Poad of Majacraft, together we are also working on building a kind of toolkit of patterns to use for circular weaving (which will be useable on any kind of circular loom and which is almost finished! ), and we are also building the story behind the page, the crisis in the land of Vierhoekje according to the Journal we found detailing some rather odd events. Working with other people is a really good way to achieve goals, as you tend to keep each other going to reach targets, and the ideas develop into a much broader spectrum than when working alone. I have also found this with all our FiberyGoodness.com activities, working with my amazingly awesome partner Arlene, we spur each other along and spark off new ideas with our different perspectives on things. These little circle looms are so non-intimidating and easy to pick up and just start. Its not a big commitment like starting a sweater or warping a loom – you can just play, and before you know it you’re done! You hit all the points of how fun it is to weave on this little loom. I love the fact I can take it with me. It is also a great way to use up the leftover handspun! !